I arrived a few days after the banks had collapsed in a grim neoliberal foreshadowing as to what was going to happen in the States a decade later. Bank accounts were frozen as the government put salvaging the banks above feeding the people. There was anger and rioting, tear gas and rubber bullets, and a brass band. Always, there was a brass band. Sometimes shirtless, often shoeless, with a few dinged-up instruments creating a wild cacophony of joy to riot to. A tiny country with the equator running through three distinct topographies – the coast, the alps and the jungle – its claim to being “el mitad del mundo” rings true. It feels like you are living in the heart of the world. It is life, concentrated. And its people seem more real and more alive than any I have encountered in my many travels. Which is why I was not surprised when this plucky nation knowingly took on the wrath of the western empire in granting Julian Assange political asylum in 2012. While my own sycophantic country, Australia, pathetically ignored the plight of its own citizen, Ecuador defiantly strode forward, and did what no one else was willing to. In an interview with German publication Deutsche Welle, Ecuador’s president confirmed reports that revoking Assange’s political asylum is being actively considered and remains an option on the table, saying that his administration will “take a decision” if the WikiLeaks editor-in-chief refuses to comply with instructions to cease voicing his political opinions online. Saying that Assange’s public geopolitical analysis has “surpassed the limits of freedom of expression”, Moreno’s conditions on Assange’s continued asylum amount to a demand that Assange cease to practice the journalism he was granted political asylum for in the first place. 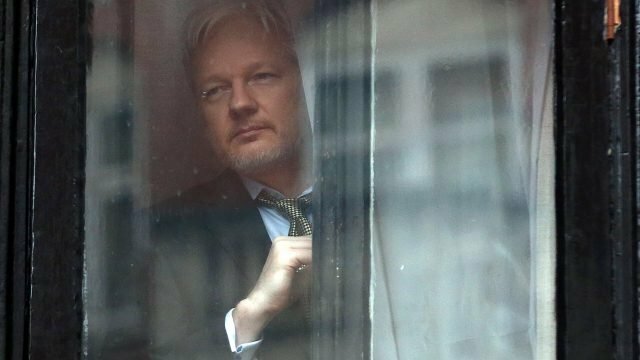 WikiLeaks has publicly and repeatedly denied that Assange ever made any agreement to refrain from political commentary as a condition of his asylum at the Ecuadorian embassy in London, and indeed we have never heard any talk about any such agreement until after Moreno took office last year. Assange has now been in effective isolation without any access to visitors, phone calls or Internet for two months, reportedly due to a tweet Assange made criticising the Spanish government’s oppressive response to the Catalan independence movement. All three options that Assange is being offered result in his being silenced. The police patrolling the embassy have standing orders to arrest him as soon as he sets foot outside regardless of his diplomatic status, the British government has for six years refused to say whether it has received a US extradition request for him, and the Trump administration has made no secret about its agenda to arrest Assange and crush WikiLeaks. He either rots in isolation, remains politically silent and inactive, or goes to prison under the same government which tortured Chelsea Manning.